Have you got a best friend? How does your close pal influence your life? We all live in a society and understand how important friends are for us. We’ve got friends we usually shop with or go out for lunch, we’ve got friends we sometimes go to the cinema or go to the gym… Well, having a friend for every occasion is a good thing, but it should be clear that having a best friend is a great bonus in life! Best friends make our life more complete, exciting and fun. And that’s really true! 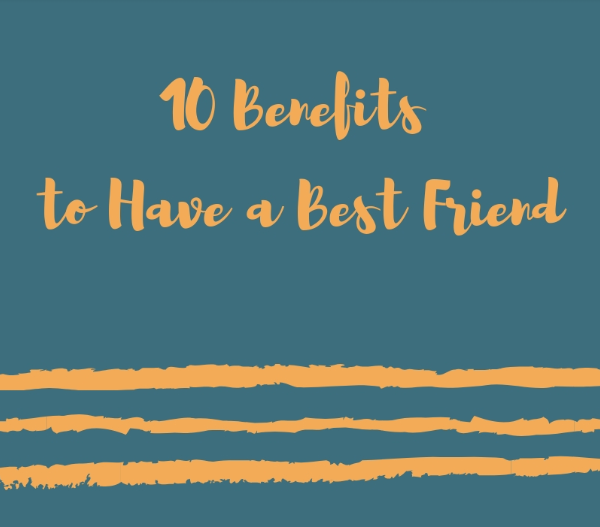 Let’s take a moment to check out the top 10 benefits of having a best friend in life. Best friends are crucial throughout life and they’re also those people who can have an amazing effect on our lives. That kind of influence helps us live and be ourselves. So now is the time to think about your best friend and be really grateful this person’s become an important one in your life. Why Best Friends Are Important? Friends… All of us have them, but sometimes we don’t realize how essential friends are and take them for granted. However, don’t forget best friends improve our lives. They make our lives better and provide a lot of benefits. Do you know the true value of your best friend? If you don’t, read this post carefully until the end. According to recent studies, having a close friend around can lift your mood very quickly. You actually know what it’s like to feel stomach aches because your pal is making you laugh so hard! Besides, it means that every time your friend makes you smile, he/she makes your thoughts more positive and makes you a happier person. Scientists showed that your true friend can reduce stress and make you feel better if you’re tense. You feel comfortable when your friend is around. This person creates your comfort zone and, thus, spending quality time with him/her helps you decrease stress levels. When you’re close to your friend, you know you can be yourself. Your best friend knows everything about you – everything bad and everything good. So, it doesn’t really make sense for you to pretend. Who else will be totally honest with you if not your best friend? The person who knows you best. He/she knows your strengths and weaknesses and can find suitable words to tell it like it is. Sometimes your close friend is the person who knows you even better than you do yourself and he/she isn’t afraid to tell you things you don’t want to tell yourself. Your true friend boosts your personal growth because you both share experiences. It can be very useful for you as when you’re stuck in a rut, it’s cool to hear what other people are doing. Therefore, your close friend is a powerful stimulus to your development. When you’ve got a best friend, you’ve got a person who can always listen to you if you want to talk about something. Moreover, you realize that you can share anything with your close pal because everything stays just between you. Having a real friend to share things with helps you learn new things about yourself. The things and thoughts your friend shares can not only open your eyes to new ideas but also can show you the right direction you have to move on. The person you consider your best friend recognizes the value you contribute to the world and helps you understand how great you are! In such a way, you become more confident… as well as more self-confident. Your best friend is the person who also has a positive effect on your health (mental and physical). Your close pal helps you fight your diseases and when you feel his/her support it’s easier for you to handle any illness. A best friend is always ready to share not only your good times but also help you in tough times. Your real friend stands by your side no matter what. This is the person who wipes your tears when you cry, supports you when you fall, generally offers the shoulder to cry on and encourages you if you’re down. If you have a person close to you with these traits, know this is your great good friend! Bottom Line: How to Keep a Best Friend? Your best friend changes your life for the better as friendship is a special kind of unconditional love. However, friendship is also a special kind of relationship and like any other kinds of relationships, it requires certain efforts to maintain your lifelong friendship. Here are 3 simple ways that can help you keep your best friend. Let your friend know that he/she is your best friend: This is very important to show your close friend how essential this person is for you. You can tell your friend about it or text. There are a lot of touching paragraphs to send your best friend on the Net. Show appreciation and spend quality time together: Of course, you’re busy, but despite that, you must find time for your friend to plan activities together and don’t forget to show gratitude to your real pal. Share your secrets and always keep in touch: If you allow your friend to be aware of your life, it makes he/she feel special. Let such a special person know about you as much as possible, try always to keep in touch even if you’re apart because this will mean that you can’t imagine your life without your true friend.